This document is a User Guide for Customer Menu Builder module for Magento. It describes how work with the extension. 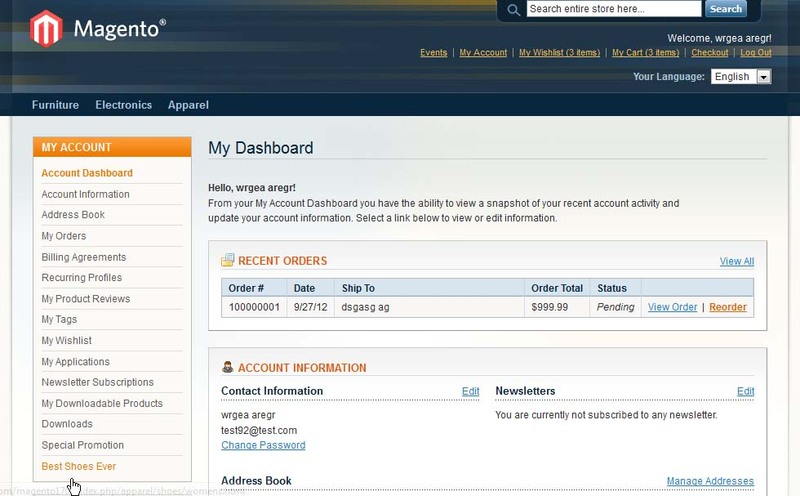 Customer Menu Builder allows direct management of the dashboard menu customers see when they login to their account. There is ability to create different menus depending on customer groups. Default menu areas can be activated/deactivated for different customer groups. There is also ability to create new menu areas (with content and widgets) as well as insert menu links with redirect. The extension works under Magento from 1.4.x and higher. Magento modules developed by IToris are provided with 3 license types - regular, premium and multi-host. Regulal license is partially encrypted. This license is website-dependent. By ‘website’ here we understand the website in Magento terms. Under one Magento installation one license key of the extension can activate all stores/storeviews. within one website. If your configuration has several Magento websites - a separate license will be required for each. Premium license activates one Magento installation. All websites, stores and storeviews under one installation are covered with one license. Premium license is 100% open-source and is recommended for customizations. Premium license is installed via IToris Installer. Multi-host license provides ability to install the module to an unlimited number of hosts. It is 100% and is installed as an archive. You can switch the license from one domain to another – login to IToris website using the credentials you will receive after the purchase. Go to My Downloads area, find your key there and reset it from the current website. Then use it again to activate another website. The license also includes free life-time updates for the extension. There is ability to select its own set of settings for stores/storeviews (use Current Configuration Scope drop-down). All menu types can be disabled (by clicking enable icon). Only enabled menu items will be visible for customers. 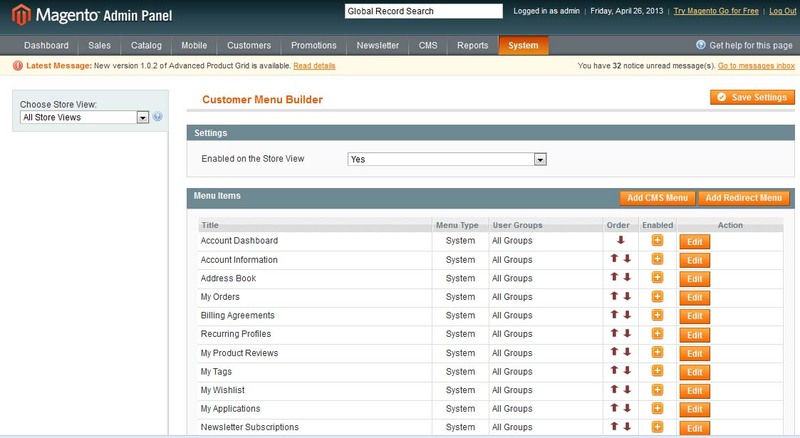 System menu contains the menu items that are available in customers’ dashboard by default (standard Magento customer menu items). Directly after the installation there will be no menu items as they need to be captured from the front-end first. Please login from the front-end as a customer and update the back-end page then, the menu items will appear. System menu items cannot be removed. They can be edited - press Edit button near an item. There will appear a window where you can choose which customer group(s) should see this menu item (the rest will no longer see it) as well as change the title. 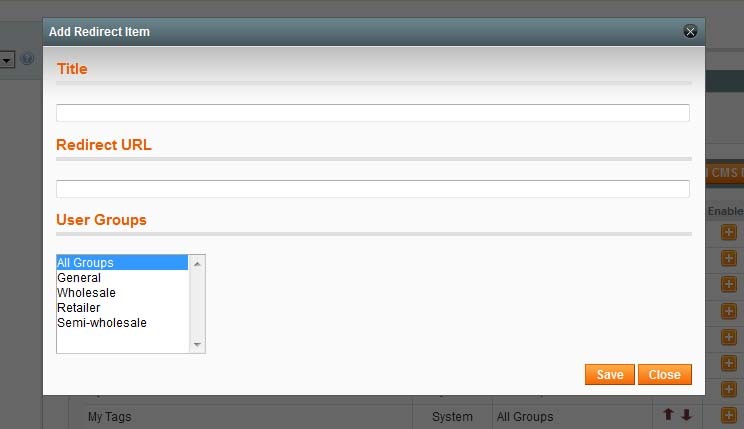 System menu can be managed this way, so that as a result different customer groups see different dashboard menus when they login. CMS menu provides menu items that you can create and add yourself to the customers’ dashboards. 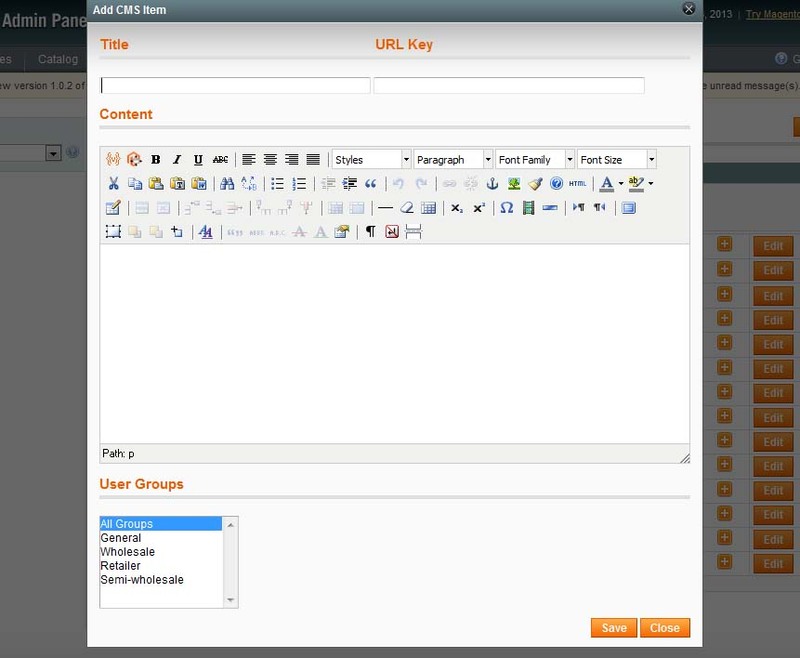 Content - here you can create any content as with a regular CMS page - add texts, images, links and so on. Please note, that you can insert there widgets as well. User Groups - select which customer group(s) will see the menu item in their dashboards. There is ability to delete created CMS menu items. Here a new CMS menu “Special Promotion” has been created. 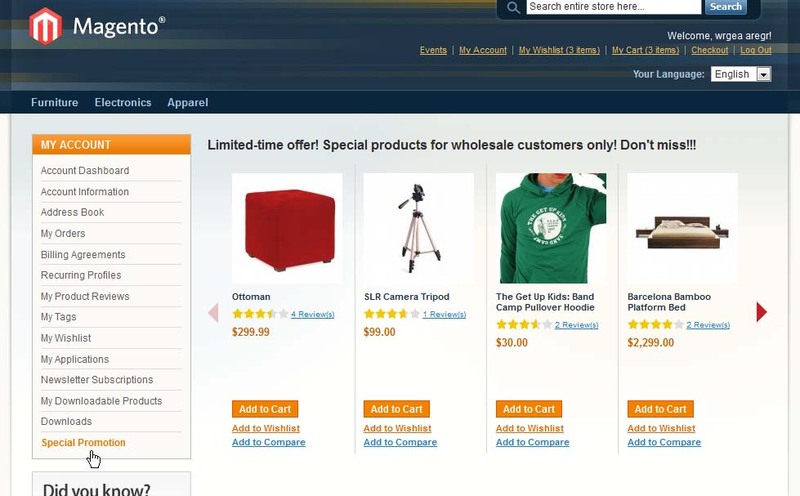 It is available for wholesale customer group only, other customers will not see this item in the dashboard. When this menu item is pressed, there opens up a new area with text and a widget of Homepage Product Slider module inserted. Redirect menu item is a link that redirects to another page on the website or another website. It is added as the rest of menu items to the customers’ dashboard, yet when it is clicked there is a redirect applied. There is ability to delete created Redirect menu items. Redirect menu item Best Shoes Ever looks like a regular menu item, yet when it is clicked there is a redirect to the shoes catalog.